In Russian, if you want to know the location of something, you’d ask: Где? And we asked: Where to? The Russian word “куда” also translates as “where” but it’s related to motion. Where to? So, let’s see if you can retain this new word while we review our recent podcasts. What did he literally ask? I’m now in the store. I’m now in the park. That “yeh” sound is very important, and here’s why. It tells the listener that you’re *in* that location. Otherwise, as we learned in the last podcast time, the “ff” or “v” sound means “to” or “towards: and they’ll think you’re on your way to that place. I now to the store. He means, I’m now going to the store, or am about to head off there. That little “yeh” sound at the end tells us they are located inside the store at this moment. So, that little sound “yeh” has a big impact on the meaning. There’s one exception that we should be aware of. The word cafe which in Russian is: кафе does not change. Ever. That’s because it’s not really a Russian word. It’s borrowed, probably from French, and it doesn’t work well with Russian grammar. So, we don’t add that “yeh” sound at the end. Of course, the next question is…Well, how will I know if the speaker is headed to the cafe or is actually there, when he says: Я сейчас в кафе. Well, you don’t. You’d have to ask a clarifying question, but that’s kind of off the topic at this point. She was asking, “You…where…now?” In other words, Where are you now? Here’s a universal fact worth noting about languages. Short words tend to have many meanings. Long words tend to have just one. And the reason is simple: Languages only have so many short words to go around, so they have to use them for lots of situations. Are the lights on? Are the lights currently operating? ..”on” has a very different meaning. The book is currently operating the table? No. The book is located apon the table. Yet, when we say, “I’m on the train to Boston right now.” Do you really mean you’re located apon — that is, on the upper surface of — the train? Like you’re riding on the roof of it? No. You actually mean that you’re riding inside of the train. I could go on and on about the different meanings of on. The takeaway here is that little words have lots of meanings, so don’t fix just one in your head. Instead, learn a whole construction which features each particular meaning. Let’s get the meaning from context. (Just a heads up: The name Anton in Russian is “ahn-TONE”). That first word, na, is forcing the next word to take on that “yeh” ending. Do you hear it? All работа and no play makes Jack a dull boy. Нет. Здравствуйте Марк. Это Владимир. Сергей сейчас на работе. Sergei is now at work. Say: She’s now at the store. Say: I’m now downtown. Or….I’m in the city center. And where are Mom and Dad? А где мама и папа? Mom is now in a store, in the center whereas Dad is at work. Мама сейчас в магазине в центре, а папа на работе. My mom is now in Moscow. Моя мама сейчас в Москве. My dad is now in Kiev. Мой папа сейчас в Киеве. My friend is now in St. Petersburg. Мой друг сейчас в Санкт Петербурге. My female friend is now in Odessa. Моя подруга сейчас в Одессе. I’m now in New York. Я сейчас в Нью Йорке. If you got all these you’re doing really well. And all I can say is keep up the great work because if you do, you’re going to become a conversational Russian speaker. In the next episode we’ll learn to talk about where we live, and ask our Russian friends the same question. Meanwhile, head over to RussianMadeEasy.com for today’s transcript and audio downloads and I’ll see you in the next episode. Thank you so much for all of these Mark. I have only just got into the exercises, they are really helpful. The main podcasts are just great to listen to in the car, the pace is very good and the grammar introduced really well. This is really terrific stuff! Hi David, Thank you for the kind words. I’m hoping to turn around the idea that learning Russian has to be difficult or unpleasant for beginners. It’s all about the techniques and approach to teaching really. If you haven’t rated the podcast in i-tunes the team here would greatly appreciate it since we are just getting off the ground with this podcast. Keep up the good work, and feel free to ask questions if you have them. I like the chance to see the Russian words spelled out since I want to be able to read Russian as well as speak it. I didn’t ever look on this website until I was through several of the podcasts on my phone, but am glad I finally checked after podcast 5 or 6. One question though, is there a list of what Russian locations, based on the starting letters, get the ‘vv’ sound and which get the ‘ff’ sound when saying ‘to the park,’ ‘to the store,’ etc, or is it just a case of knowing from practice? Mark, I’m loving these podcasts! The only thing I would like to see (and I could do this on my own) is a copy of the exercises without the answers right below (more like a test in school, with the answer key on a separate page) so I can try to write out my answers without trying to cover it up. Thanks for the content. It is being really helpful for me. I want to point that the “Full Episode Transcript” link downloads the exercises. As so, I could not access the Transcript of the audio. 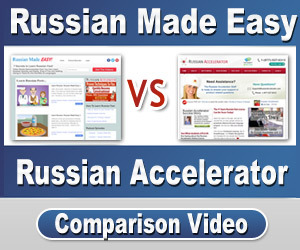 please send an e-mail to support (at) russian made easy .com and we’ll send you a copy. LOVE these podcasts. But I’m still not clear on when to make the “V” sound and when to make the “ff” sound before the place you’re going. As in в Москве. How do I know which sound to make? *Excellent* question. The fancy name for this phenomenon is called “voicing and devoicing”. We do it all the time in English and it never seems to bother us then. 🙂 A voiced consonant is one where the vocal cords vibrate. A devoiced? No vibrations. Think of how as “s” is “supposed” to sound in English. Is it an “esss” sound, like in “cats” or a “zzz” sound (voiced) like in “dogs”? and sounds like an “f” sound. But for this: “Я иду в Макдональдс” we’ll say, “Ya eedu V-makdonalds” with a voiced “v” sound for the Russian letter “B” because the letter that follows it, the “M”of McDonalds, is voiced.